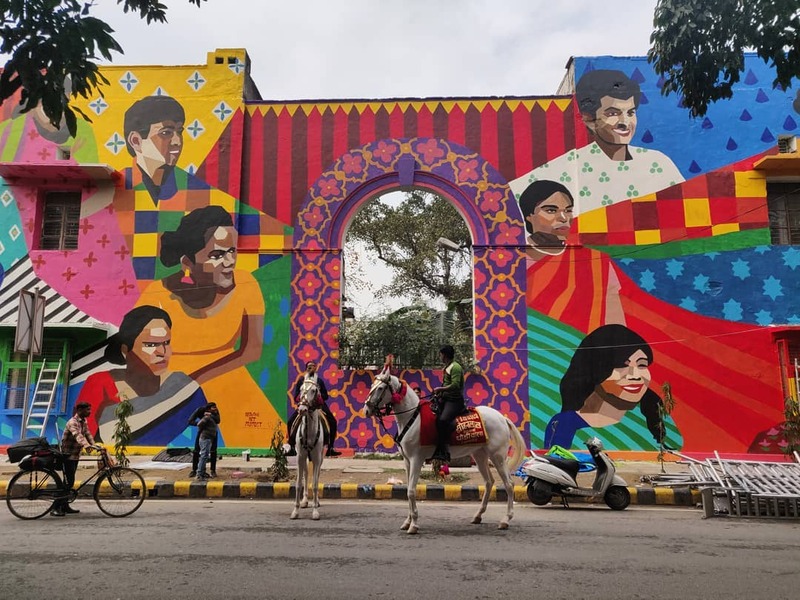 Last weekend saw me traipsing all over Lodhi district perusing the murals that artists from all over the world had splashed the arched walls of Delhi with. 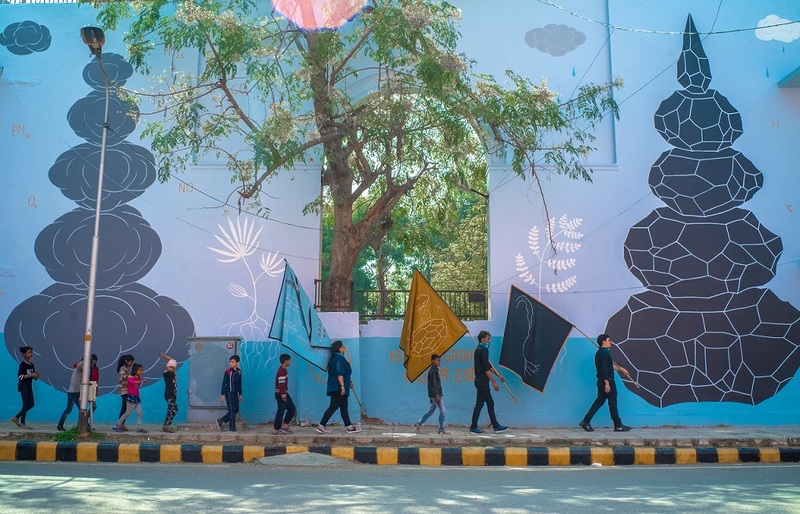 We were witnessing another welcome takeover by St+art India Foundation, an organisation that has been making art accessible to everyone since 2014 by transforming public spaces and creating open-air public art galleries. 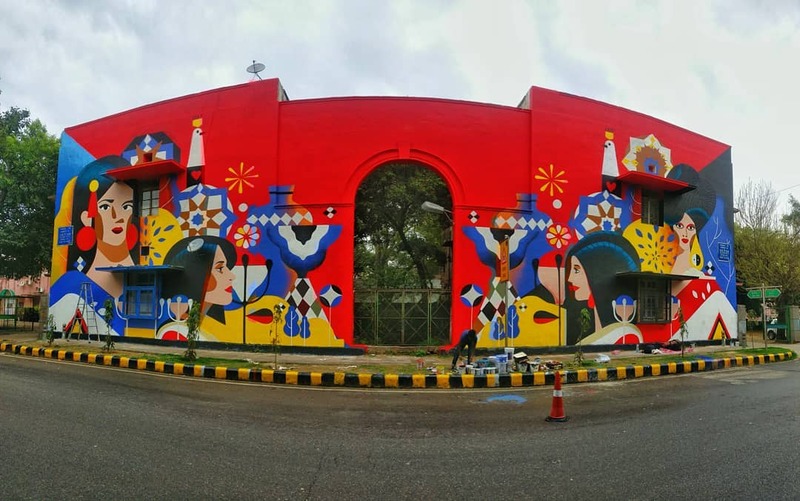 Having already painted around Lodhi district in the past, St+art, with the support of Asian Paints, has added over 20 murals to its existing showcase along with setting up an immersive art exhibition F(r)iction at KONA, Jor Bagh that offers a discourse on the changing relationship between art, nature and technology. 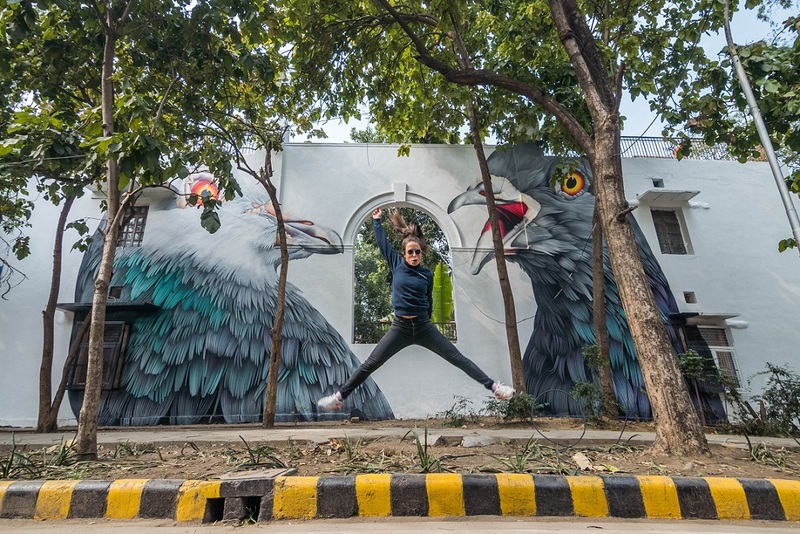 On a balmy Saturday afternoon, four writers and myself are scheduled to meet festival curator Giulia Ambrogi who has promised us a personalised tour of the Lodhi Art District followed by a private showing of the installations at KONA. 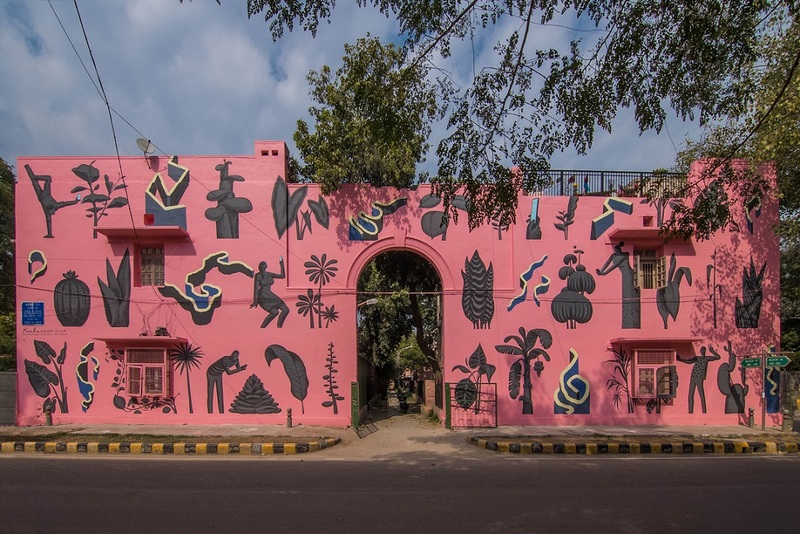 We drive through the sweeping roads of Delhi and stop in front of a bright pink mural courtesy Sameer Kulavoor. 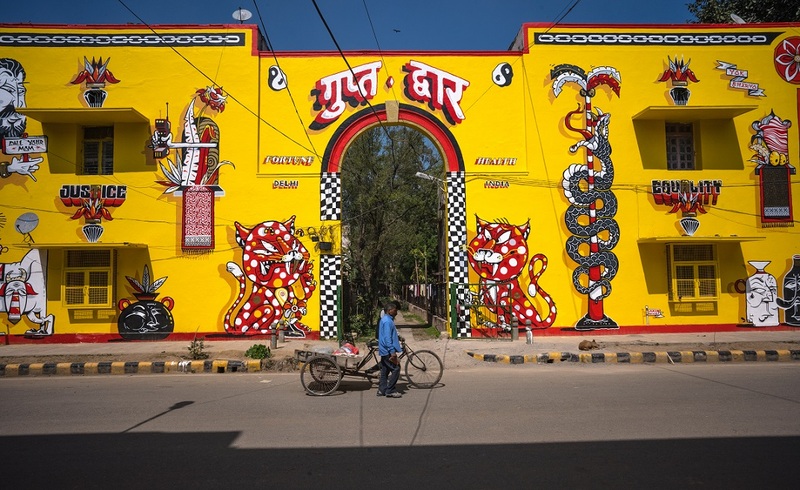 As an artist who conveys characteristic mannerisms and archetypal facets of urban surroundings through his works, Kulavoor’s art, I am told, is inspired by the unexpected phenomena that go on to achieve fame on Instagram. Titled Social Media-Friendly Plants, the large artwork comprises succulents in various shapes and sizes along with self-proclaimed influencers, who are either meticulously photographing the plant or taking a selfie with it. According to the Kulavoor, these low maintenance pretty-Pinterest-plants are akin to fast fashion — extremely viral and can help you ‘garner a few hundred likes‘ easily. As someone who belongs to the Instagram generation, I can’t help but appreciate the biting derision. But more pressing matters beg my attention. Italian visual artist and environmental engineer Andreco’s mural stares down at me through its calming blue facade in an attempt to make me deliberate the repercussions of climate change. 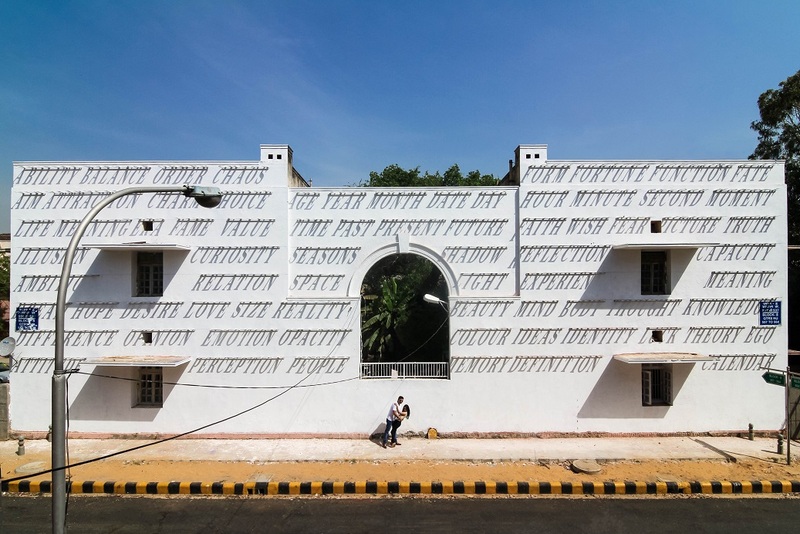 The left side of the wall represents the current elements of polluting emissions which have been painted with AirInk, the first ink in the world made entirely out of air pollution and created by an Indian start-up. The right part of the wall presents a solution to the crisis in the form of an alternative environment with wetlands and clean air. In the centre of the wall stands a tree — a symbolic tool for climate action and the catalyst for combatting air pollution. We also watch masked volunteers preparing for the parade the next day where they will march with flags designed by Andreco that represent the Yamuna river, the best local plants for air and the water pollution remediation and other images that represent a vision of a cleaner future based on scientific data. A stray car passes by the road every now and then as the group methodically practises their routine but respectfully makes a U-turn upon learning about their cause. We walk over to the adjoining lane and stumble upon a brightly-coloured wall with the faces of many people on it. 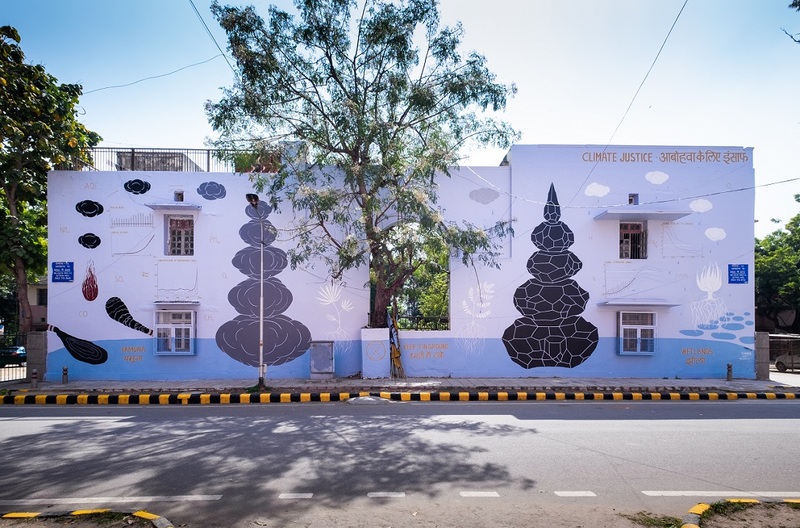 In a successful attempt to be inclusive, St+art collaborated with Aravani Art Project, the transgender community of Delhi and helped them paint their first mural in Delhi in front of the local school of Lodhi Colony. The collective is known for painting large scale portraits of transwomen from across the country to combat stigma and stereotypes against the community. 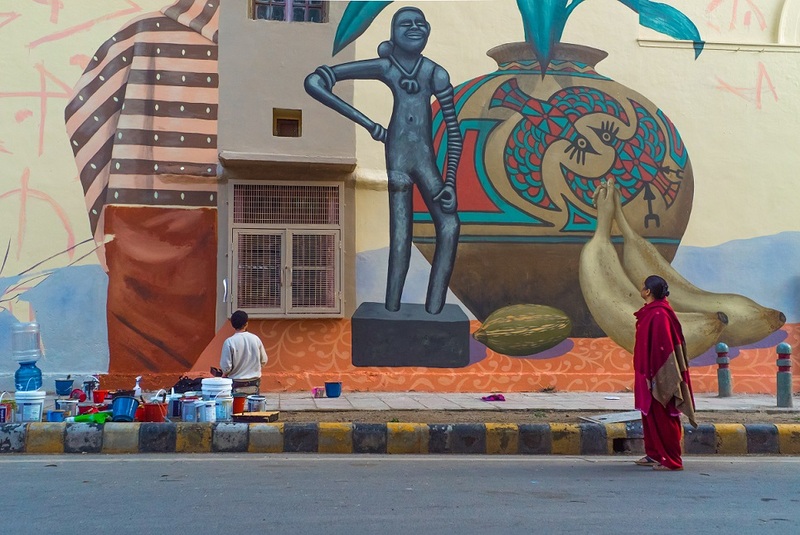 Their wall in Lodhi Colony is a retrospective on their body of work and brings together delicate portraits of women they have worked with in the past as well as sketches of those women who have shaped their philosophies. 15 transwomen and several volunteers contributed to the execution of the wall and I am told that they deliberately chose a wall in front of a school to display their art so that curious children might inquire about it and learn a thing or two about being accepting. Perhaps one thing St+art may have to work on is inviting more female artists to be part of their roster; at present roughly 80 per cent of their murals are the handiwork of established male artists. In fact, it’s ironic to see an artwork that’s an ode to Indian women and femininity being painted by a man, even if he is as brilliant as Sajid Wajid Shaikh. I have to say that one theme that stood out for me most was the various artists’ interpretations of time. DAKU’s typographic piece ingeniously visualised the concept of time by playing with letters and shadows. The oldest forms of measuring time were sundials used by the Egyptians as early as 1500 BC, and this piece took that concept to a new level by mounting several words on the wall which cast an evolving shadow through the day. The words in this piece not only speak about the ephemeral nature of street art — most of the letters have been ravaged by pigeons making the words illegible — but also highlights all the things in life which assume different meanings throughout the course of our lives. 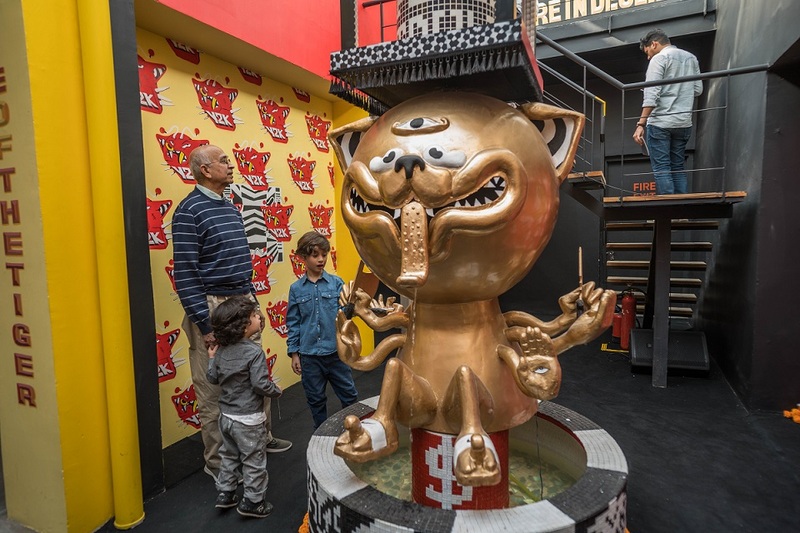 We drove over to the installation display at KONA where we came across Singaporean artists Yok and Sheryo’s Temple of Indulgence from the year 3001 which is a shrine to social media and documents the adoration and devotion bestowed upon memes, apps, fake news and selfies and the resulting social unrest, extreme narcissism and IQ degradation. The temple is watched over by cult-meme-turned-enlightened-guru Nyan cat who has gained millions of followers over the years and is a fitting commentary on a generation that has access to vast knowledge and technology but uses only the inconsequential. Next up, in the spirit of envisioning the future — was Ficus Benghalensis which operates on the premise that humans will have wiped out every form of terrestrial ecosystem by the year 2070. 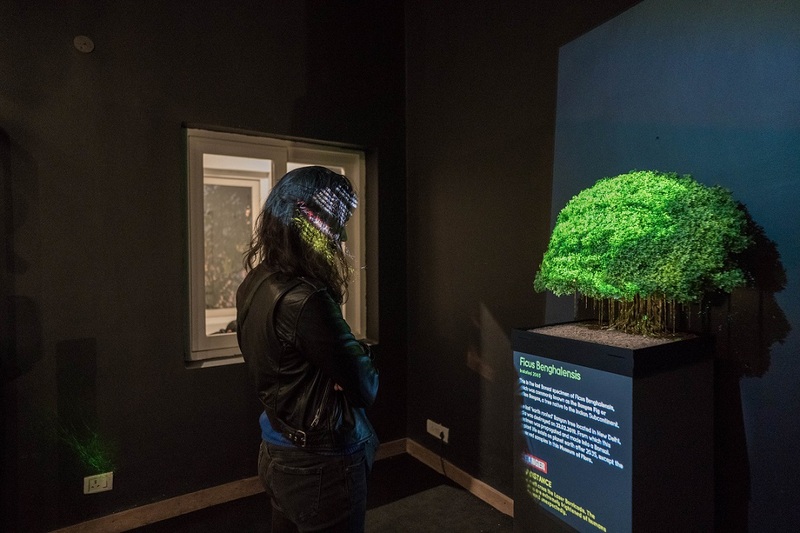 To view any form of plant life, we will have to visit The Museum of Flora, where the rarest collection of plants will exist in the form of Bonsais. 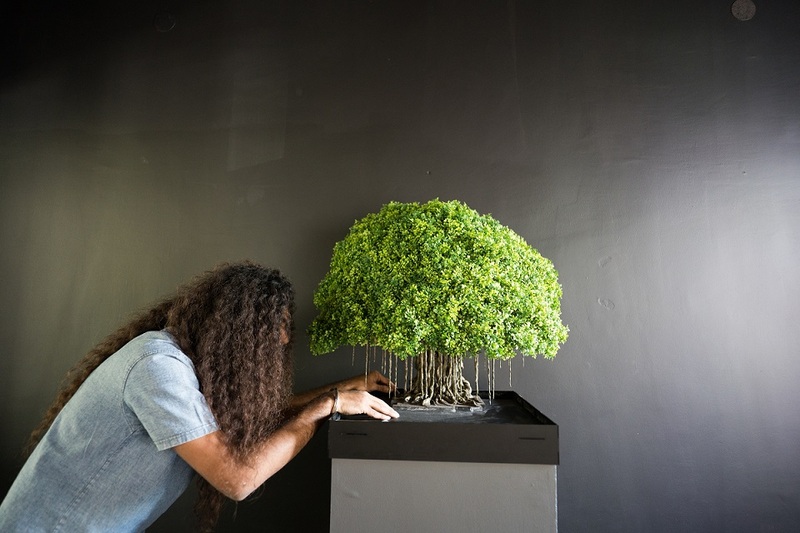 The Ficus Benghalensis — Indian Banyan Tree — was presented in the form of a small bonsai which has a soul that reacts to the human presence. Of course, our curiosity led us closer to it, triggering an infrared beam that caused the plant to take on the face of an angry human and chide us for being fully aware of the deteriorating condition of our planet, but not doing anything to reverse years of environmental damage. 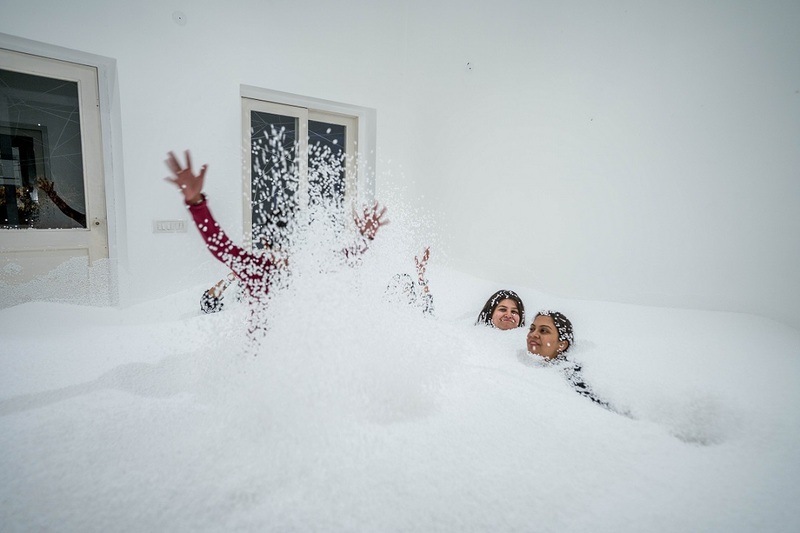 Finally, merging the decline of our generation with the concept of time was Hanif Kureshi’s ‘confetti room’ which required its occupants to wade through a room of thermocol balls. The artist meant to demonstrate how the social network is becoming denser each year, expanding beyond the geographical restrictions of the real world and as we surf through it compulsively, each molecule within it clings to us even as we surf out of it and exit those apps. And surely enough, confetti was flowing out of my pockets and had gotten tangled in my hair even after I had brushed myself off violently. Art does have a funny way of making you consider your lifestyle choices and Kureshi’s bordered on Black Mirror-level provoking.